Competed in the Division Level (Division K) Quartethlon contest held at the Forum Hall of the Casino Filipino in Paranaque. Here are the contestants (area champions) in today's division contest (left-right): Les Aquino from Area 78, Voltaire "Volts" Victoria from Area 77, DivGov. Rema, Ernesto "Jun" Lomuntad from Area 76 and Leonor "Norrie" Cristobal from Area 75. In Impromptu Speaking, the table topic was: "If you were at a party abroad, who would you be most interested in talking to: a billionaire, a Hollywood actress or an Olympic gold medalist." Norrie chose the billionare (Microsoft's Bill Gates); Les chose the athlete (Ian Thorpe, Olympic Swimmer); Jun chose the athlete (Lance Armstrong, Tour-de-France Cyclist); and Volts chose the actress (Marlyn Monroe). Three of the four contestants, from left to right: Jun, Les and Norrie. Volts wearing his costume (leather jacket) for the Singing category. The seated lady with the red blouse is Aret Esconde from DHL, the Test Speaker for the Evaluation category. The title of her speech was "A 15 peso ride and a Free Movie". Her speech was about her observations in an MRT ride. It was humorous and all the evaluation speeches were good. Gov. Rema Manzano awarding me the Runner-Up place for the Speech Evaluation category. Jun Lomuntad bagged the Division level championship and will advance to compete at the District Level (District 75). Overall, the competition was very close and was definitely a good show. Chief Judge was Christine Temblique DTM and the other judges included Raul dela Vega and Jimmy Pamintuan. 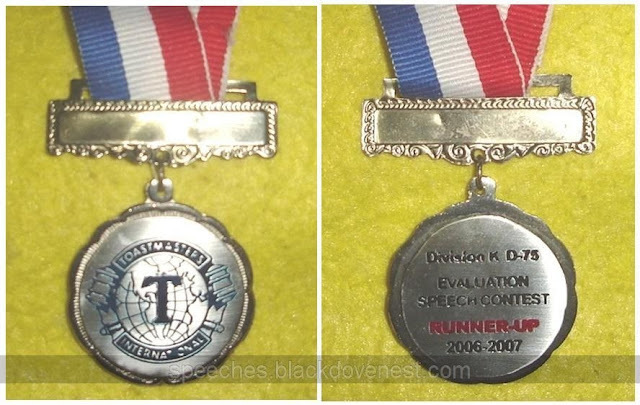 My lone medal for the Division Level Quartethlon - Runner-Up in the Evaluation Speech Contest. My complete medal haul for the 2006 Quartethlon, now mounted and proudly displayed in a glass frame. Four medals in Area level and one in Division level. What a grueling contest! I'm just so glad it's over.